That was until his Coreldraw9 started freezing again! Poor old little mite that he is, he’s so down and sad again now. Tsk! I sprang awake at 0130hrs and could not get back to the land of nod. Tsk! So I decided to go down and bring the laptop up to work on me blog and post some photo’s of Lynton from his visit yesterday. I got all the bit and pieces up okay – but could I find me camera? After searching the front room draws shelves floor etc and failing to find it – I searched the kitchen (that’s the only downstairs rooms in the house), then decided I had lost it completely. Bamboozled and annoyed with myself puts it lightly. I managed to get em ready. Then tried to load the internet and the laptop beeped then froze on me. I had to press and hold the start button then reload/start the laptop. But it’s been alright since? Coreldraw9 keeps freezing, and I have to force close the flipping laptop, done it three times this morning. Oh woe is me, well down now. Tsk! Did some work on a new post for a while, during which I felt the dreaded warm and wet sensation from the little ‘Inch’. Bleeding again… Hey-ho. I can’t go to the clinic today because I’ve promised to go with Sister Jane to the hospital for her to have checks on her knees and hips done. Bit of support yer know bless her. Good job I got some graphics done earlier to use. Also I said I’d try and take some photo’s today of the older parts of Nottingham for the TFZ group. So I’ll aim to walk to town in plenty of time to meet Jane at 1315hrs at her bus stop, then catch bus to the Queens Medical Centre, and take some on my way. Spit and polished myself check Inchy (dribbling) and got things ready to take with me to meet Jane, I hope? Set off on my walk into town planning on taking some pictures en route for the TFZ’ers site – but the knees were so bad a diversion would have meant me being late to meet Jane and Pete. 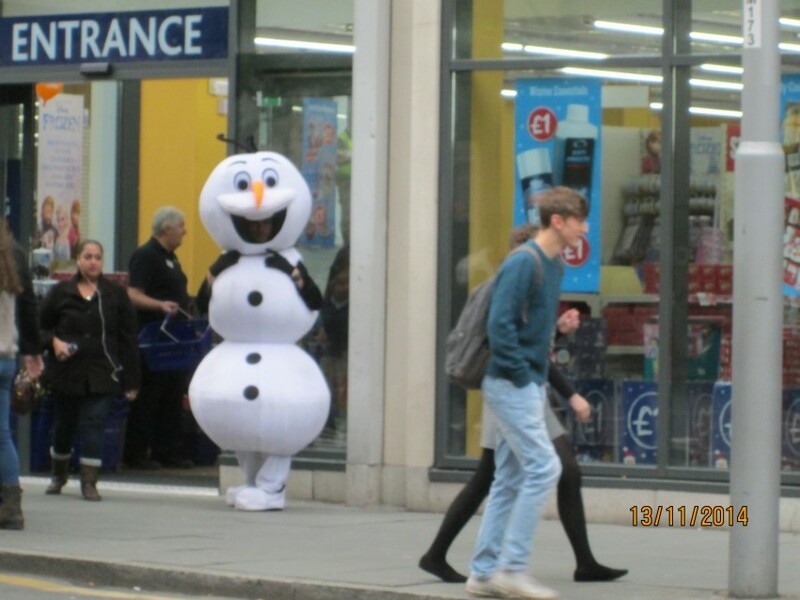 I couldn’t resist taking a photograph of the poor chap as I passed from outside of Pound World, who they had dressed up in Snowman costume and had apparently been hired to wave at the children? Got into town and met them, we then caught a bus to the QMC arriving in plenty of time. They both looked in good form, but Pete’s hearing is getting as bad as mine at times. We had a good natter while waiting and Jane was called in early for her tests. They were completed in half an hour and we caught a bus back to town. 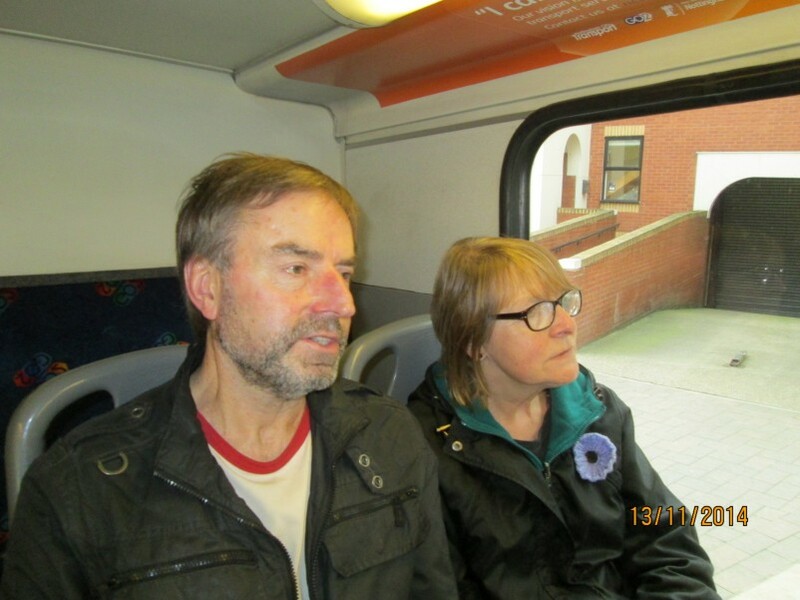 I took some photo’s of them on the bus, I don’t think Jane was too pleased about it because the lighting on the bus changed her hair colour in the photo. 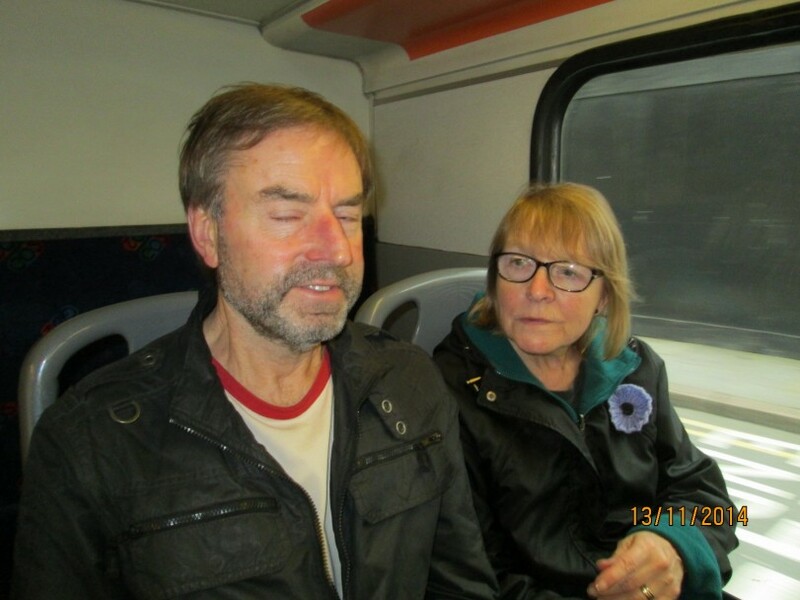 Said our farewells and I caught a bus back to the dump. When I got in all I as good for was getting my head down after applying more pain gel to me knees.